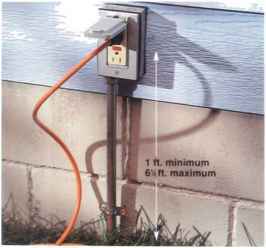 Consider the circuit length when choosing cable sizes for an outdoor circuit. 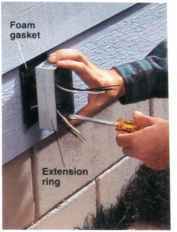 In very long circuits, normal wire resistance leads to a substantial drop in voltage If your outdoor circuit extends more than 50 feet, use larger-gauge wire to reduce the voltage drop For example, a 15-amp circuit that extends more than 50 feet should be wired with 12-gauge wire instead of 14-gauge. 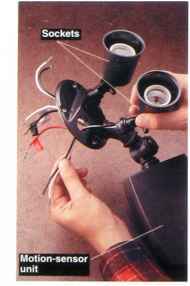 A 20-amp circuit longer than 50 feet should be wired with 10-gauge cable. 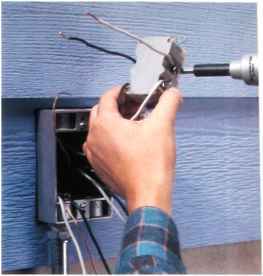 As you begin planning an outdoor circuit, visit your electrical inspector to learn about local code requirements for outdoor wiring. 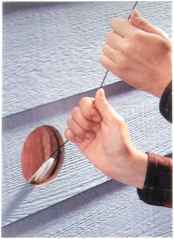 The techniques for installing outdoor circuits are much the same as for installing indoor wiring. 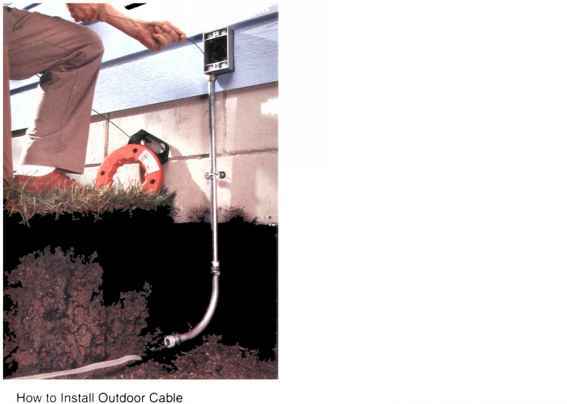 However, because outdoor wiring is exposed to the elements, it requires the use of special weatherproof materials, including UF cable (page 176), rigid metal or schedule 40 PVC plastic conduit (pages 184 to 185), and weatherproof electrical boxes and fittings (pages 170 to 171). 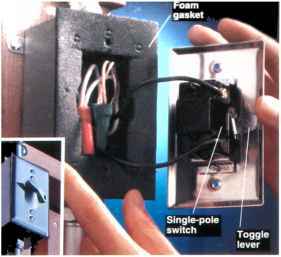 The National Electrical Code (NEC) gives minimum standards for outdoor wiring materials, but because climate and soil conditions vary from region to region, your local building and electrical codes may have more restrictive requirements For example, some regions require that all underground cables be protected with conduit, even though the National Electrical Code allows UF cable to be buried without protection at the proper depths (page opposite). 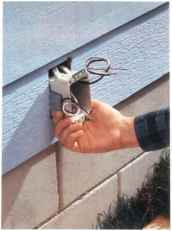 For most homes, an outdoor circuit is a modest power user. Adding a new 15-amp. 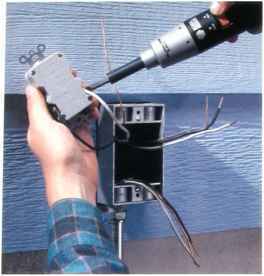 120-volt circuit provides enough power for most outdoor electrical needs. 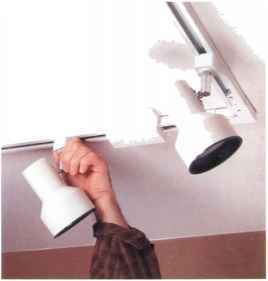 However, if your circuit will include more than three large light fixtures (each rated for 300 watts or more) or more than four receptacles, plan to install a 20-amp. 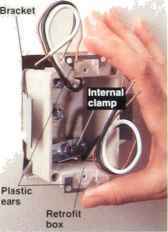 120-volt circuit. 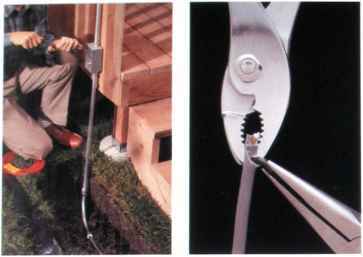 Or, if your outdoor circuit will supply power to heating appliances or large workshop tools in a detached garage, you may require several 120-volt and 240-volt circuits. 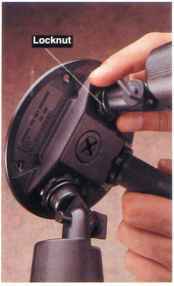 Before drawing wiring plans and applying for a work permit, evaluate electrical loads (pages 148 to 151) to make sure the main service provides enough amps to support the added demand of the new wiring. 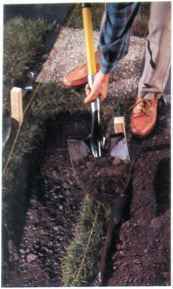 A typical outdoor circuit takes one or two weekends to install, but if your layout requires very long underground cables, allow yourself more time for digging trenches, or arrange to have extra help Also make sure to allow time for the required inspection visits when planning your wiring project. 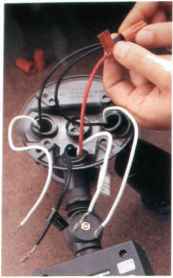 See pages 138 to 147 for more information on planning a wiring project. 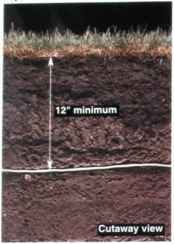 When laying underground cables, save time and minimize lawn damage by digging trenches as narrow as possible. 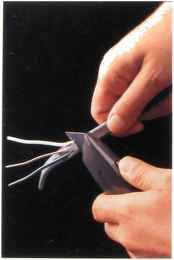 Plan the circuit to reduce the length of cable runs. 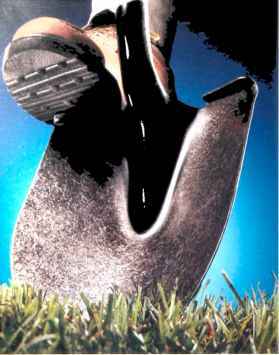 If your soil is sandy, or very hard and dry. 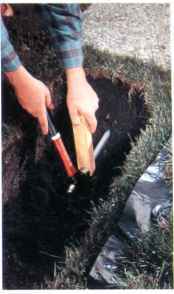 water the ground thoroughly before you begin digging Lawn sod can be removed, set on strips of plastic. 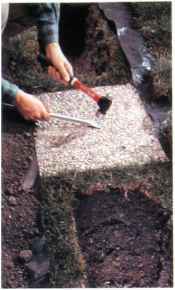 and replaced after cables are laid Keep the removed sod moist but not wet. and replace it within two or three days. 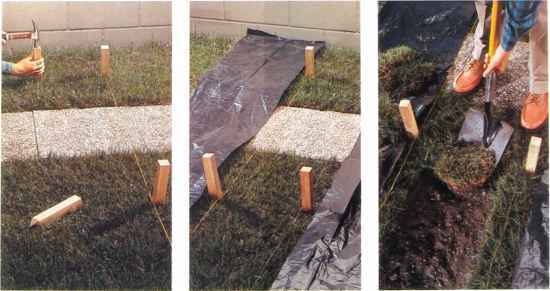 Otherwise, the grass underneath the plastic may die. 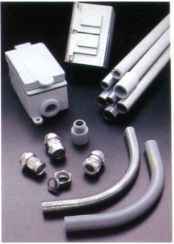 Stakes, string, scrap piece of conduit, compres sion fittings, plastic bushings. 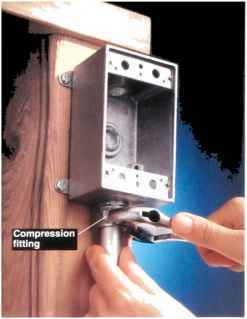 Use cast-aluminum or PVC plastic boxes for outdoor fi tures, and install approved conduit to protect exposed cables Standard metal and plastic electrical boxes are not watertight, and should never be used outdoors Some local codes require you to install conduit to protect all underground cables, but in most regions this is not necessary. 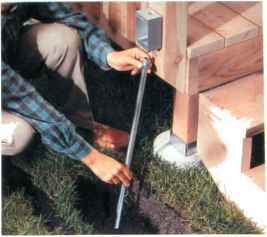 Many local codes allow you to use boxes and conduit made with PVC plastic (page 171), while others allow only cast-aluminum boxes and metal conduit. 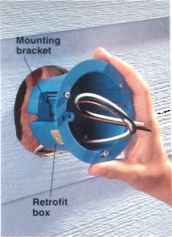 Begin work by installing the retrofit boxes and the cables that run between them inside finished walls. 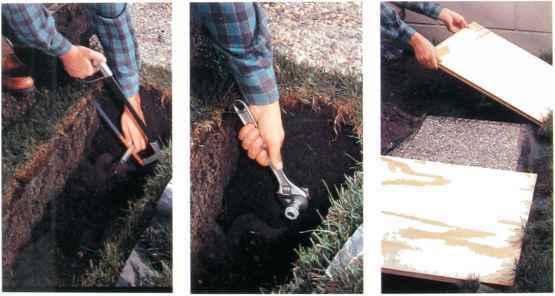 Then install the outdoor boxes and conduit. 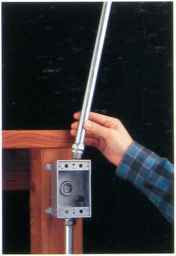 NM two-wire cable, cable staples, plastic retrofit light fixture box with grounding clip, plastic single-gang retrofit boxes with internal clamps, extension ring, silicone caulk, IMC or rigid metal conduit, pipe straps, conduit sweep, compression fittings, plastic bushings, masonry anchors, single-gang outdoor boxes, galvanized screws, grounding pigtails, wire connectors. 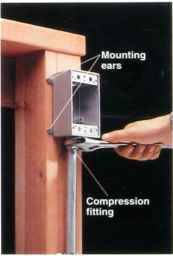 1 Outline the GFCI receptacle box on the exterior wall. 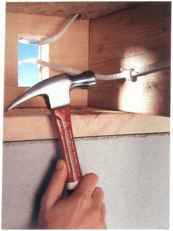 First drill pilot holes at the corners of the box outline, and use a piece of stiff wire to probe the wall for electrical wires or plumbing pipes. 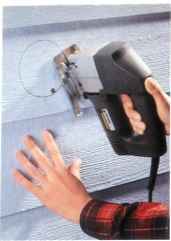 Complete the cutout with a |ig saw or reciprocating saw. 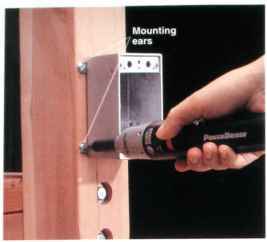 4 Estimate the distance between the indoor switch box and the outdoor motion-sensor box. 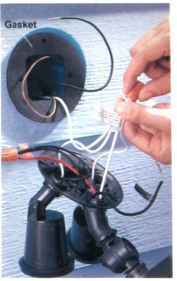 and cut a length of NM cable about 2 feet longer than this distance Use a fish tape to pull the cable from the switch box to the motion-sensor box. 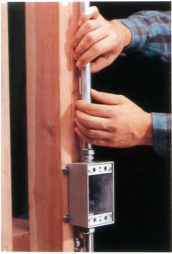 See pages 182 to 183 for tips on running cable through finished walls. 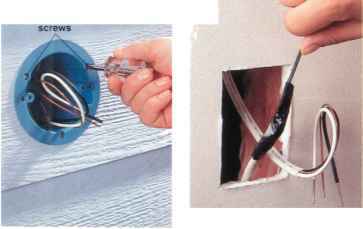 each end ot O the shea"
Because outdoor wiring poses a greater shock hazard than indoor wiring, the GFCI receptacle (page 266) in this project is wired to provide shock protection for all fixtures controlled by the circuit. 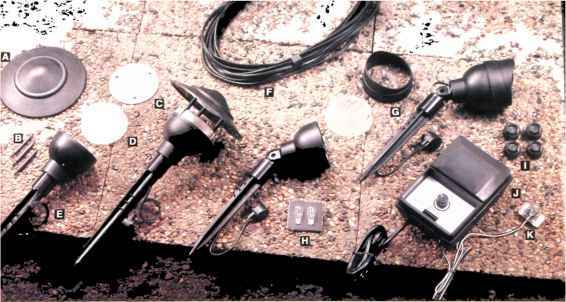 Motion-sensor light fixture, GFCI receptacle, 15-amp grounded receptacle, outdoor switch, decorative light fixture, wire connectors. 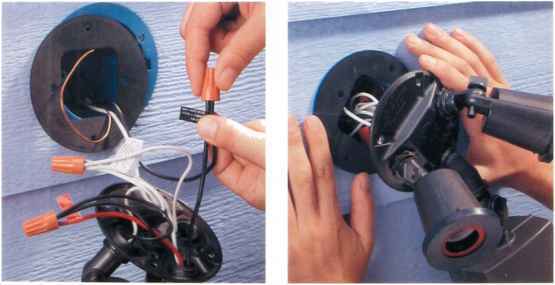 2 Secure the motion-sensor unit and the bulb sockets by tightening the locknuts. 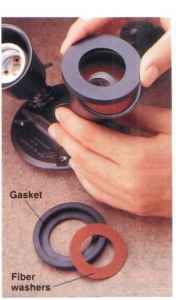 3 Insert the fiber washers into the sockets, and fit a rubber gasket over the end of each socket The washers and gaskets ensure that the fixture will be watertight. 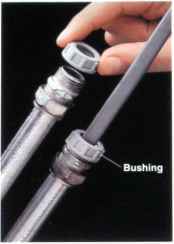 How to install watertight plastic conduit fitting? 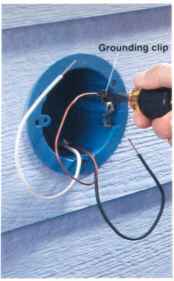 How to run uf b wire to box exterior? 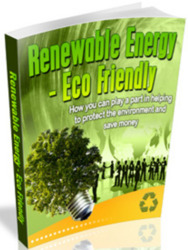 How far does uf sheathing have to be inside boxes? 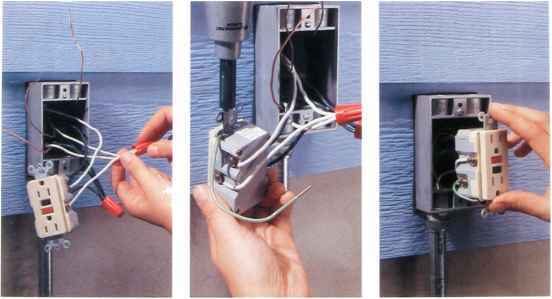 How to attach conduit to circuit breaker box? 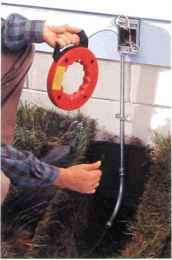 Can i run rigid conduit into an outdoor box? 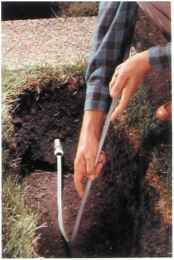 Is there way to make electrical conduit watertight?